He was in his own world. It was a different world than that relative to the imagination of a boy’s childhood; consisting of glory and revenge, wars led by their hearts and alien invasions provoking burly stuntmen to be the masterminds of noble escapes. Something beyond trips to the clubhouse, pulling toy trucks in a red wagon to the shrouded sandbox, to discuss the plans behind the pirate hats and the hunts for the treasure beneath the “X marks the spot”; under which there was actually no treasure. He wasn’t further along than the other children, who were simply immersed in the essence of their boyhood, but he was younger still, dilatory to when words were only sounds, harsh war cries emitting sentences of gibberish that he so believed to be a foreign language; derived from the apparent aptitude of emerging from the womb as bilingual. He often sat alone, up in his room, and stared at the mirror. He believed there to be something queer about it, about it’s indifference to his reflection, and while at seven years old he did not much care about his appearance, the mirror was intriguing in its quintessence. His parents found it bewildering, yes, but they figured such a phase would pass. And although his nights were occupied by the mirror, his days were spent in chaos. Most of it happened on The Hill. All of the boys in town—and the girls, as the boys above Stephen would be indignant to mention—belonged to wealthy middle class families. They and their parents resided in vast, steeple-roofed houses; “castles” as the city boys would chime upon their visit. But it was hardly unfamiliar to the spoiled children of the neighborhood, as they had practically used up every inch of their multiple-acred yards with purposeless expeditions and winter tobogganing. Although the village was small, it seemed as if Stephen’s house lay opposite from those of the other families. It very well may have been isolation that created Stephen’s disinterest in customary boyish fancies. But it left him alone with his own imagination; to dwell, and be mindful, and play atop The Hill. The Hill was about to Stephen’s waist, and he was only four feet tall. It lay adjacent to the road down which a car hardly drove, and was brushed with dry dirt pebbles that often caked to Stephen’s face after it rained. He regarded it as war paint, and would let out a fearsome howl that sounded as if it belonged to an animal. “Stephen!” His mother would cry, running out into the yard with a dish towel over her wrists. He wondered what there was to hide. “Stop making that dreadful noise!” To which he would roll down the other side of The Hill and hide until she went back inside. Then he would creep back on top of The Hill with a faint smile on his face before launching himself from a poised ninja form, and into a gallivanting cannon ball. He hadn’t cried out when he had fallen, but even if he had, his mother had long since ceased obsessing over small shouts of both pain and glory. Stephen consoled himself that as long as he wasn’t where she could see him from the window—well, he didn’t exactly know what he was scared of. Two days passed quickly, and it was the first week in July; the grass browned golden like a loaf of banana bread, and indeed it was as if the village were concealed in an oven. Sometimes when Stephen was out playing, he could see the steam rising from the old cornfields across the street. Although the isolation wasn’t dreadful, Stephen’s lack of companionship did not satisfy him. And now, he longed for a playmate more than ever. He would traipse inside the door with his head hung low, slamming the door, and would complain to his mother, “I want some kids to play with, Mama.” She would at first be genuinely surprised, due to the fact that he had always seemed content, by himself with the outdoors. The phase must be passing, she figured. So she smiled and replied, “I’ll take you to the playground tomorrow, okay baby? That’s where the other kids play. Now run along, Stephen. You’re shoes are muddying the floor!” So he ran along. The following afternoon, Stephen found himself anticipating the strangeness of the playground; the third official place that he had ever been. The first was his room, the second was The Hill, and now, The Playground. He gripped his mother’s hand. He did not want to go. One glance at The Playground told him all he needed to know. A bunch of strange puzzle pieces protruding from an irregular wooden figure, with one yellow tube emerging from the rear. It looked foreign, and dangerous. Worst of all, dozens of kids were running around, swinging on rope-like appendages and jumping from platform to platform. They screamed, and guffawed, and fell onto the gravel. They were just like him. His confidence wavered considerably. When he had imagined other children, he had imagined weak, wet little animals, with pink skin and thin bodies; bodies he could crush with a squeeze of his fingers. He imagined himself, standing at the top of a hill, watching their tiny heads split and roll away when they hit the ground, while he let out his war cry and stood triumphantly at the peak of his castle. Why were they so big, so loud? So rambunctious and forthcoming, so dauntless and energetic? He didn’t know how to cope with it, and his sock was bunching up inside of his shoe. It was uncomfortable. He wanted to go home. “I want to go home,” he said aloud. His mother would not have this. “I hate friends!” He exclaimed, and began to cry. He didn’t even know what “friends” were, but he didn’t like the sound of it. The other mothers sitting conterminously around the park payed the two a speculating glance, and the misbehavior was humiliating the reputation of Stephen’s mother’s devotion as it related to her quirky and mischievous son. His mother blushed, embarrassed at Stephen’s outburst, and tried to get him to calm down. “Go play,” she said. “It’s alright. Go on.” Eventually, she got him to detach from her burdened arms. Feeling a newfound bravery, Stephen headed immediately for what seemed like an enlarged brother of The Hill, an immense tower of dirt scattered with pieces of wooden chips. It was located at the outer edge of The Playground, next to what all the children were calling “the fireman pole”. He clambered up its side and stood at the top. He waited patiently for his opponents. It was a slow process, the waiting. He stood up straight, his hands on his hips, face glowing an appropriate beet red. He waited for a peer to challenge him, but likewise, no one did. They were too enthralled with the thing called The Playground, although it hardly looked like a place to play to Stephen. The jungle gym appeared as though it were jagged teeth, and the tunnels were like dark cages. Stephen imagined it like a giant animal, keeping its human counterparts hostage; though in lesser words. Suddenly, a half hour into boredom, a stocky tow head with a freckled face approached Stephen on the mound. His pale arms stuck out like tentacle fragments from his green t-shirt, sweat blotching his underarms; the skin under his chin seemed to roll off of his neck. His face was rather toad-like, and the fohawk that shaped his head faded into the fuzzy glow of the sunlight, like an angel, but somewhat different. “Hey!” The kid exclaimed in an unfitting high-pitched greeting. “Hey!” Stephen exclaimed in return, blushing, feeling both surprised and flattered at the boy’s confrontation. “Do you wanna play ‘king of the hill’?” He posed hastily and spontaneously, ignoring the question. Just then, before any reply could be conjured, another boy sauntered up to where Ralph and Stephen were standing. He was shorter than Ralph and in similar height to Stephen. He had dark hair complimented with olive skin, and wore an Under Armor shirt. He gave Ralph a shove. “Whatcha doing?” He yelled. They’re all so loud, Stephen thought. “Who’re you, now?” Stephen demanded in an amplified voice, thinking that this was the “cool thing”, and also frustrated that the younger boy had interrupted Stephen’s planned challenge meant exclusively for the boy named Ralph. “That’s Luca,” Ralph answered pompously. “I was asking him,” Stephen said, his confidence returning. “What’s your problem?” The boy named Luca dared. He was so skinny that Stephen could see his pronounced ribs through his shirt, as if he was on the other side of an X-Ray. I could break him in half, he’s so thin, Stephen thought, and suddenly began to have second thoughts about challenging Ralph. Luca’s body figure would make him considerably easier to beat. “Wanna play ‘king of the hill’?” Stephen asked, yet again abandoning the conversation at hand. “Sure,” Luca said, shrugging, an arrogant smile coming over his face. “Me too,” Ralph injected, running up the hill and then jumping down, falling and rolling onto his back. Stephen laughed. Ralph got to his feet and brushed himself off. His eyelashes were invisible in the sunlight. Ralph and Luca climbed up the hill, standing with Stephen at its peak, and when Stephen called the word, “Go!”, they all began to push and shove one another. Luca was the first to fall, but he quickly scrambled up the side of the hill and elbowed Stephen in the gut. It was difficult, more so than Stephen had expected, and as his hands kept slipping off of their bodies, he was the second to hit the ground. Dirt stung his eyes, and mixed with the tears of his hurt pride. But he could not cry and make himself a coward in front of the other boys. When Ralph finally lost his footing and rolled down onto the grass, Luca smugly declared himself the winner. Luca then insisted they play a second time, since in his eyes, this one victory was said to lead to all future victories. Ralph and Stephen both agreed, desiring to strip Luca of his title. When Luca won the second time, Stephen felt his anger rise up inside of him like the fire in a volcano. He had practiced this one game for all seven years of his life, and who would beat him now? A skinny boy who came from The Playground, a junkyard where all he did was play while Stephen worked? Something switched on in Stephen’s brain. He let out a continuous war cry, like a coyote, and launched himself up the hill. Luca is weak, Stephen thought. He is weak, he is weak, he is weak, he chanted to himself, and suddenly Ralph had disappeared from Stephen’s field of view, Luca being his only target. When he reached the climax of the hill, Stephen grabbed the collar of Luca’s shirt, screaming relentlessly, and furiously threw him down the hill. But as his went to release the other boy, he was tackled from behind by no other than Ralph, who had mistaken Stephen’s unpremeditated attack for the start of a new game. Stephen’s vision blurred and his eyes narrowed. I need to escape, thought Stephen. I need to escape to get Luca. He subconsciously planted his knee upwards between Ralph’s legs. Ralph lay in fetal position in the dirt and began to cry, holding his crotch. Stephen set his eyes on Luca once again. He stood on top of the hill, staring down at Ralph. Stephen began to climb, his fingernails grasping fistfuls of dirt. His eyes looked like slits, red-rimmed, and when he reached the top, he grabbed Luca by the neck and thrusted him downwards. Luca screamed, surprised, and started to kick at Stephen’s shins, but Stephen hardly noticed. He dragged Luca towards the edge of the hill, and Luca was coughing, his tongue curled and just past his lips. It was an awful, disturbing sound, like the deep laugh of a villain, and the power surged through Stephen. Luca’s hands slapped desperately at Stephen’s face, and his olive skin grew pale. Tears came out of his eyes as he began to cry; long wailing sobs with intermediate hiccups transformed into nearly silent cries that sounded like when the water tap has been left barely on. Finally, he let go of Luca, and pushed him down the hill. And he probably would have been okay, if it weren’t for the fireman pole. But instead, Luca’s body fell in a heap, his head snapping back against the metal. When his neck broke, the sound reminded Stephen of when his mother cracked eggs. Immediately Luca’s body went still. A feeling of satisfaction flooded Stephen’s chest. I defeated him, he thought. I am king of the hill. That night, when his mother wept in the room adjacent to his own, it failed to irk Stephen’s conscience. He listened as his father’s soft words attempted to console her and silence doubts of his own. But Stephen no longer understood the cause of what it meant to wept, or even the act of weeping itself. He didn’t know why she cried so. It was a brief and guiltless rumination, for something had changed inside of him. Even the things he didn’t understand, he didn’t much care to disentangle, for his blood now seemed to run cold, and his heart had passed out of him, possibly through recent excretion. He was even further separated now from the world in which death wasn’t just a side effect of an opponent’s victory. He had subconsciously dismissed Luca’s death as a sacrifice to ‘the king’. Incited by the fact that Stephen didn’t know much about death at all, he came to these rather simple and naive conclusions. So he didn’t ponder as he sat within the confines of his bedroom, but merely sat, staring at the mirror. This night he payed attention to his reflection. He wore navy blue pajama pants and a purple and orange striped t-shirt; his close-cropped blond hair was washed, and his dimpled face too, the impassive expression of his poker-face and his wide, brown-eyes occupying the whole of the mirror. He kicked his legs back and forth, his feet occasionally brushing against one another or smashing like toy planes against the comforter. He stayed there in silence for a while, and eventually his ears tuned out the melancholy sounds coming from the next room. He stared at the wall. He would have just kept sitting there, if he hadn’t he seen something in the mirror. He stood up and walked over to where the mirror hung on the wall, pointedly frowning, and saw that in his reflection, there was a small smile on his face. Stephen frowned deeper, so much so that he had an underbite, but the smile on the mirror only formed into a ghastly grin. Stephen, all the more confused, put his face up against the mirror, his nose flattening against the surface. I knew it, he thought. It’s alive. A piece of classical music erupted from inside the living room. It had been a while since his mother had played those records. Fast orchestral notes slowed to a leisurely and melodic arpeggio, before speeding up again. Stephen thought he heard pans clanking in the kitchen; the noises of his distraught mother. When the grin did not disappear, Stephen brought his hand up to the mirror and then backed away gradually until the backs of his knees hit the foot of the bed. The mirror figure backed away as well, but when Stephen took a closer look at his right hand—the one that was raised in the air—he saw that his middle and ring finger were spread apart. He thought this was quite ingenious, and physically spread apart the fingers on his hand to match. He then made them open and close like an alligator’s mouth, bringing his hand steadily across the length of the mirror. The hand in the reflection followed. alligator, alligator, do you wanna play? Wiggle pinky, wiggle thumb, what I gonna say? He was halfway through the second set of verses before he heard footsteps pattering down the hall, and then the click of the door lock. He leapt from his position by the mirror and bounded into bed, landing on his knees and then encasing himself in his covers. He took a quick glance at the mirror. It was empty. “Hello, Stephen,” his father said gravely as he entered the room. He was a kind man; tall with a dark and unruly mammoth beard and wrinkled blue eyes—he reminded Stephen of a Viking, except without the torch and horned hat. His eyes were pink around the edges, and Stephen succinctly noted that maybe he had been weeping as well. He observed it as nonchalantly as he would recognize the color shirt he was wearing; as if it deserved no further explication. Stephen did not reply, his Indiana Jones sheets now tucked under his chin. He didn’t really know what it was, Indiana Jones. “Are you ready for bed?” His father croaked, as if something was caught in his throat. Stephen smiled and nodded, yawning. His father blinked away a tear and seemed to hesitate before leaning down to kiss his son on the forehead, as if Stephen was somehow dangerous. Stephen did not notice. “Hungry Caterpillar?” Stephen asked, referencing his favorite book, along with The Foot Book by Dr. Suess. The older man finally touched his lips to Stephen’s hairline before standing back up. “No,” he answered definitively, rubbing his hand across his own lined forehead. “Not tonight, Stephen,” the man barked, but not loudly. He made a move to exit the room. Exhausted, Stephen turned over in bed again and cupped his hands over his mouth, yawning quietly yet again. Then he closed his eyes, but he was not asleep. “Where’s Mommy?” He asked sweetly. Without turning around or breaking a stride, his father said, “Asleep,” and left the room, though Stephen fell asleep to the muffled sounds of his mother’s distressed whimpering. After two weeks time, Stephen’s mother had decided to take him back to The Playground. It was a unanimous decision, between his mother and his father, and though Stephen had expressed no wish to return, they felt as though the incident between Stephen and the dead boy could not be the last of Stephen’s encounters with the other children. They figured that teaching Stephen to abide by the rules of humanity would be the only way to restore normalcy over their strange son. After the funeral—which Stephen had not been permitted to attend—his mother had primarily gotten over Stephen’s murdering of Luca. Her husband would sometimes catch her with a misty look to her eye, and sometimes on week days, she would put in the classical tapes and stare at the wall. But publicly she was the dedicated mother she had once always been. Stephen had protested against the foreseeable return to The Playground; he did not feel it necessary to be associated with the other boys for another time. But his mother, in having the ultimate say, insisted that Stephen was required to attend. To forestall the trip, Stephen had preemptively feigned a cold, but the next day, he found himself standing before the thing that he had once feared. Originally, his mother had planned on escorting him onto The Playground as to avoid another fatal accident, but as she got caught up in a conversation with a pregnant woman near the park tables, Stephen continued onto The Playground alone. When he reached the hill, to Stephen’s surprise, Ralph was waiting for him. “Hey!” Stephen said with a smile. Ralph did not return his excited delivery. “Hey,” he said, rather monotonously, frowning. “Let’s play ‘king of the hill’.” Stephen shrugged, though bewildered about Ralph’s eagerness to play Stephen’s game. He was glad though, that he was spared the pre-game conversation. Stephen started up the hill, but Ralph grabbed his arm. “No,” he said firmly. “Not here. Come with me.” So Stephen followed him. They walked for a while, in the opposite direction of The Playground. They ambled through the fields and along the riverbank, the overgrown grass scratching at Stephen’s ankles, and soon they were out of sight of the parents on the other side of the park. About halfway through the stroll, Stephen became aware of a large group of boys that had begun to follow the pair. He looked back one time and saw a pack of about ten of them, trailing at a distance of about twenty yards, all carrying sticks of similar lengths. Stephen figured they were weapons, and it made him fear them. “Keep your eyes on the path,” Ralph would prod him. And indeed there was a path. They had taken what resembled a dirt road that winded between the trees; skinned white birches that bent over the children as if they had a hunchback. They may have been fearsome on a windy night, but as for this summer day, the sunlight’s effulgence skipped off of the leaves that coated the ground, and shed a spotlight across the branches of the scraggly birches in such a way that made them attractive. No other words were uttered, and Ralph escorted Stephen through the forest in silence, that of which was only seldom broken by the soft breeze. The other boys had caught up to them by now, and they surrounded Ralph and Stephen in a make-shift semi circle, like moving walls that obstructed movement from all sides except for forward. As if they thought I might escape, Stephen thought, as he caught an odor of sweat on the wind. It was coming from Ralph. They finally arrived at the far end of the woods. They stopped inside of a cavern, open at the top, revealing a cloudless sky, and the sides extended at least thirty feet in the air, enclosing the boys on all sides in a thick cage of black rock. It looked quite nice to Stephen; a waterfall trickled down from the far corner, flowing across the moss-covered stones into a clear pool that was illuminated by the sunlight. Small tunnels were carved into the rock like corridors, under which were vast openings that looked about to collapse. But this was not what intrigued Stephen most. In the center of the opening, there stood a mountain, or what looked like one to Stephen. 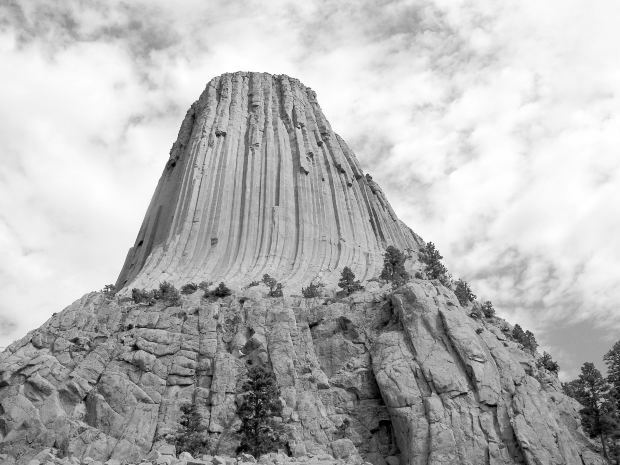 A tower of concave sharp rocks, most of which were a dark gray, culminated to a height of nearly six feet above ground. Around the base of the hill, water accumulated steadily, as if it aspired to be the moat surrounding a castle. It’s glorious, Stephen thought, and what a throne it would be. When they broke into the clearing, the silence simultaneously broke, whispers beginning to emanate from the boys behind Stephen. He could not hear what they were saying, but all of the anxiety he had traveled with on the indeterminate journey had dwindled since seeing the beauty of their destination. Subsequent to the tiny outburst, Ralph proceeded to cease the chatter. “Let’s play,” he said, but it seemed to contain a different meaning for the boys than it did for Stephen. Suddenly, the clouds moved overhead, extinguishing the sunlight and sending a thunder bolt to sound in their ears. Stephen cowered from it as a small child would, and was suddenly apprehensive once again. He noticed the looks in the boys’ eyes; full of rage, instilled with a purpose. The darkness continued overhead, spouting rain like a fountain with a broken nozzle. They were here for a reason. One of the boys jabbed at Stephen with his stick, and Stephen took a step backwards. “No swords,” Stephen argued aloud. “It’s not in the rules.” Another boy poked the stick at Stephen’s stomach. No one answered. “Ow,” Stephen said under his breath in a high-pitched whine. He kept stumbling backwards, batting at the sticks with his hands. He started to sob. “Ow,” he repeated again. His heel met the side of the mountainous hill, and he stumbled before ascending slowly, facing the boys and they continued toward him. Stephen reached the top of the hill. When he brought his foot back, there was only empty space. Something rumbled from behind Stephen, like a rock coming loose. He didn’t turn around to observe. The boys closed in on him. Finally, they halted. Ralph dropped his stick and advanced towards Stephen. “Help,” Stephen said. Ralph kept walking towards him. “Help get them away from me!” Stephen screamed, snot running over his tear-streaked cheeks. He sobbed. “Help!” He cried desperately. Ralph narrowed his eyes, his mouth set in a grim line across his toad-like face. “Help yourself,” Ralph said, and then shoved Stephen down the hill. His back hit first, and the rock punctured his back, and he screamed pathetically, as the rest of his body rolled in a tiny heap down the hill. He was stopped by the wall of the cave, his stomach and face engulfed in the puddle of water. Turning his face sideways as if to breathe, Stephen cried and held his stomach, where his shirt was becoming inked with a small spot of blood from where another rock must have broke the skin. He dragged himself under the shelter of one of the tunnels. When his head passed inside the entryway, he heard the rumbling again from before. Stephen turned his head back to glance at Ralph and the other boys, who were standing in a scattered posse at the top of the hill. Suddenly the rumble seemed to shake the entire cave. Stephen looked upward and saw the cave above him crumbling. And his blood-curdling scream was cut short by the rock collapsing in upon his head. It was a horrid sight, his head smashed under the stone, separated from the rest of his limp body by a fragment of space. It looked like a piece of his cheek was apart from the remainder of his face. The boys dispersed from where they had been standing, clambering to the bottom of the hill, not knowing necessarily the damage they had inflicted. One boy bent on his knees, cradled his stomach in his arms, and vomited on his sneakers. The other boys watched him, and jeered at him, but they knew that something was not right inside of them. They wandered around alone, uncertain, and eventually they all disappeared through the hole of the open cave. One boy still stood by himself at the top of the hill, still and tranquil in the newborn silence of reverent nature. Then the boy named Ralph gazed once at the discarded body that lay within the shallow depth of the pool, and just as the rain ceased to fall, the killer crowned himself the king. I literally just joined this site, and I love to read suspense/thrillers. I really enjoyed your story, honestly – and writing! You write very well, and have a unique way in which you do it, I think. You use enough description and you have a good vocabulary about you, which I like a lot. From a reader’s perspective though, I’d like to give you a few pointers. There going to be entirely from my point of view, and everyone might not agree. I think predictability is a huge thing with stories, especially if you want to keep them interesting. If it hadn’t been for your writing style alone, I’m not sure I would have read all the way to the end. Honestly, about half through I predicted what I thought would be the story’s end – and I was completely right by the time I got there. I’m not saying it wasn’t a good story, it was. I think you could have found ways to make things a little murkier. Try to make things seem as if there going one way and then at the last minute make them go the next. From the moment your story said that Stephen’s mother wanted him to go back to the Playground I thought “this is it, he’s gonna die at the end.” Try to keep your reader from suspecting the end – at least keep them from getting it right! I don’t know if that matters or sounds better to you, but it’s just a thought. Do with it whatever you’d like. I think you write very well! That’s what caught my eye in the first place. A lot of stories I read are written by people that just can’t write to capture my attention, but you did. I really enjoyed it!